I have very long, thick hair that can quickly turn dry if it is not well maintained. When I put on the hijab I discovered that it also doubles as the most effective hair conditioning mask I have ever used. In the morning brush a good amount of olive oil into dry hair, making sure you get rid of all the tangles. Plait it and then twist the plait into a bun. Wear your hijab as normal during the day and discover beautifully soft hair when you get home and take it off. It really does work, and works exceptionally well in hotter climates. I also plait my hair with a small amount of olive oil before bed so it's nice and soft in the morning. 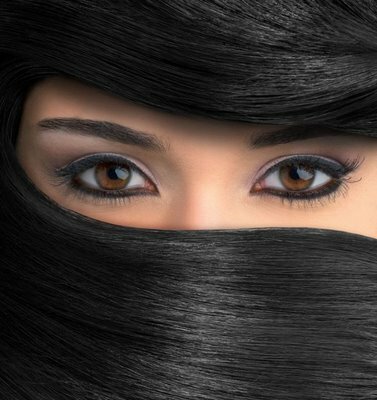 This works well if you don't wear a hijab but I've found that there's something about covering the hair for a few hours that actually makes the technique work much better. Hope this works for you if you're having trouble with dry hair! Salaam: Um I don't know I haven't tried it. Wouldn't it get all over your Hijab? Or leave an olive-oil scent? I have some info to share. If olive oil gives off an unpleasant smell or the oil is too thick, then its recommended to use coconut oil, which isnt as thick, doesn't smell as strongly, and easier to get its stains out of clothes. Grapeseed oil would be the best, but its also the most expensive. All this comes from my Egyptian friend who's been putting oils in her hair for like 10 years. I use grapeseed oil if I have signs of damage to my hair (also long which I plait). However I use it as a treatment, not for regularly conditioning. One warning; do remember to keep washing your hair very regularly. If not it's easy to get a build-up of 'dead' oil and that does stain. Im not sure for married women if having oil in ure hair at night time is the best looking thing to do lol...but i think when the husbands are away for the day it would be great to nourish the hair with. What happens if your hair is already oily at the root but dry at the ends? Will it help this type of hair? Thanks for sharing the beauty tips. Anon: I'm not married so I wouldn't know but I'm sure he would appreciate the way your hair turns out! Anyway, I'm not saying to drench the hair in oil, just put a bit on your fingertips and run that through the dry areas, it really does make the hair soft and beautiful. It works very well for me, but I do have thick hair so I can get away with putting more in. Oh if it's oily on the roots I don't know if you should use oil at the tips, maybe try a tiny bit on the very tips and see if it works. I actually sometimes wish I wore hijab for this reason alone! Terrible, I know.